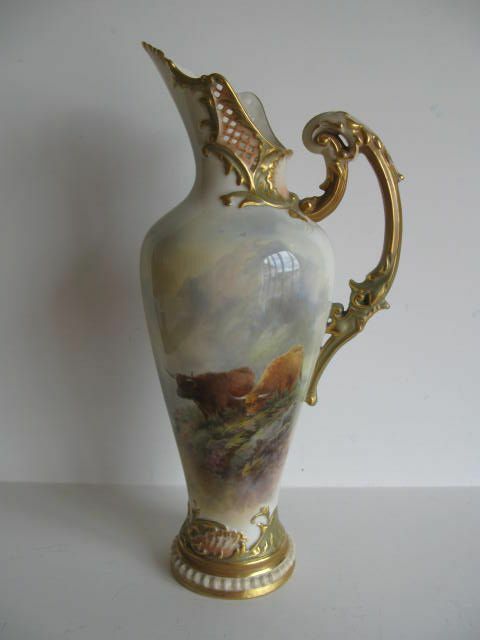 A Royal Worcester Cattle Vase By John Stinton. 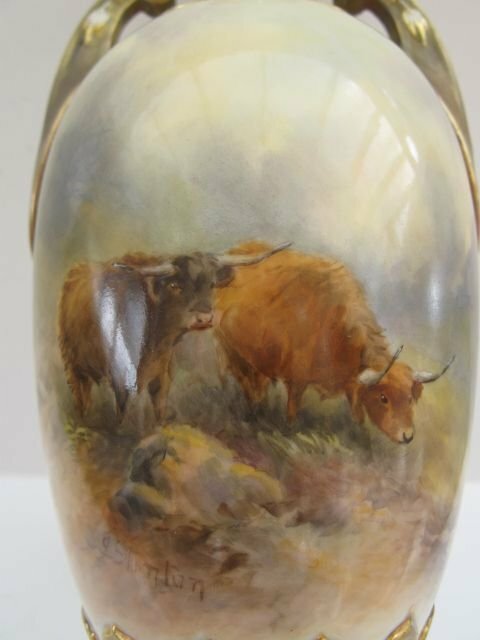 A large, Royal Worcester lidded porcelain vase, shape number H179, with well painted Highland Cattle in a mountainous Scottish setting by John Stinton. 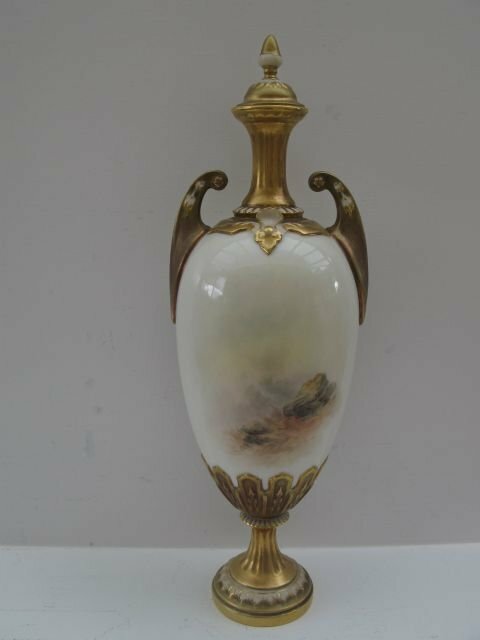 Standing approximately 12.1/2"overall height x 5.1/4"wide, it has the puce factory stamp for 1922 and is in excellent condition with no damage, crazing or restoration, and the gilding is virtually unworn. 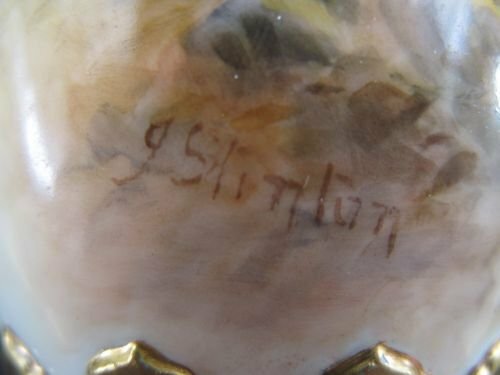 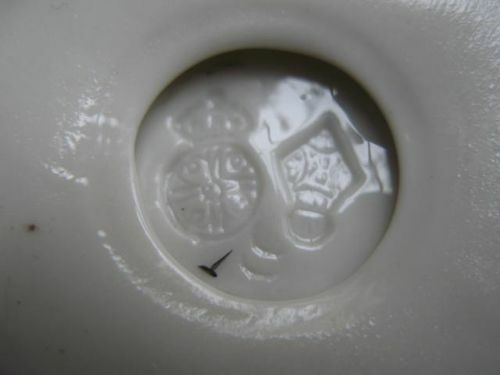 The only qualification to the condition report is that the vendors from whom we purchased the vase did advise that when they bought the vase, they were told that the finial of the lid may have been reglued to the cover. 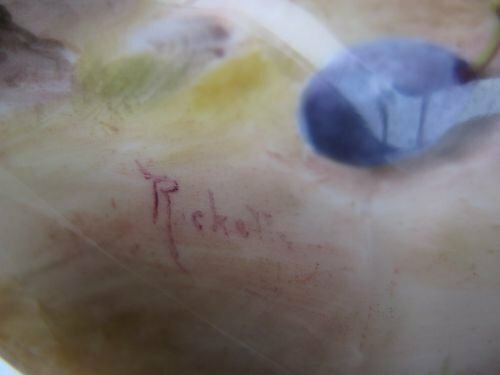 There is no obvious sign of this and nothing shows up under ultraviolet examination, but please assume that it has been reattached. 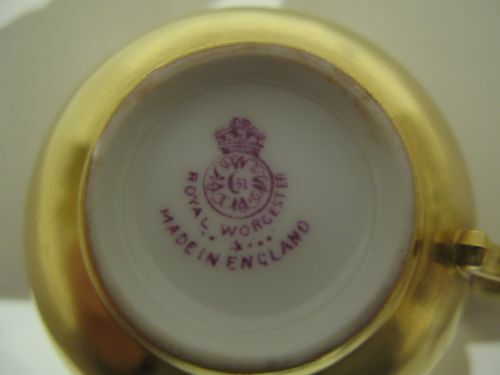 A Royal Worcester Chaffinch(?) 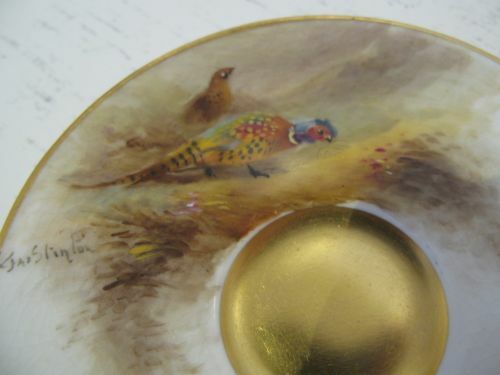 Painted Pin Dish. 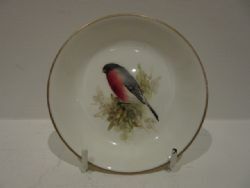 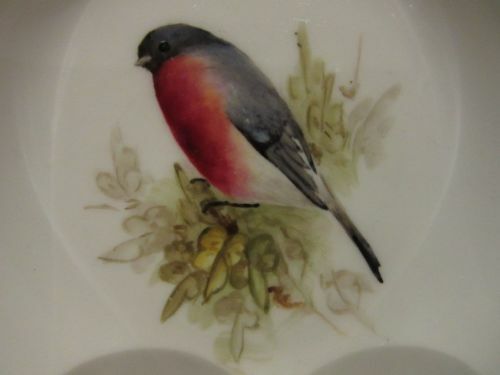 A small Royal Worcester porcelain pin dish, with a well painted picture of a Chaffinch perched in foliage, unsigned but probably the work of specialist painter William Powell. 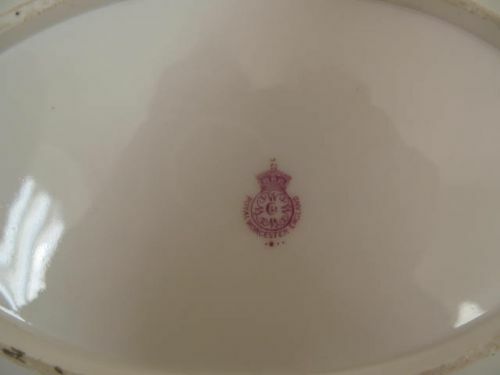 Measuring approximately 4"diameter x 3/4"deep, it has the puce factory stamp for 1929 and is in very good condition with no damage, crazing or restoration and the gilding shows only slight signs of wear. 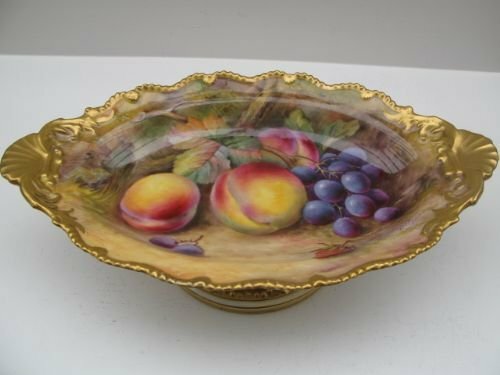 A Royal Worcester Comport With Fruit Painted Decoration By T. Lockyer. 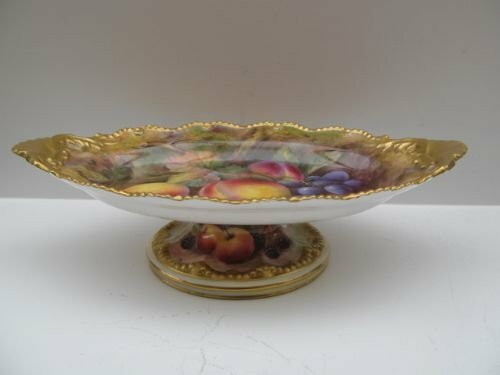 A good, Royal Worcester comport with well painted fruit decoration by Thomas Lockyer. 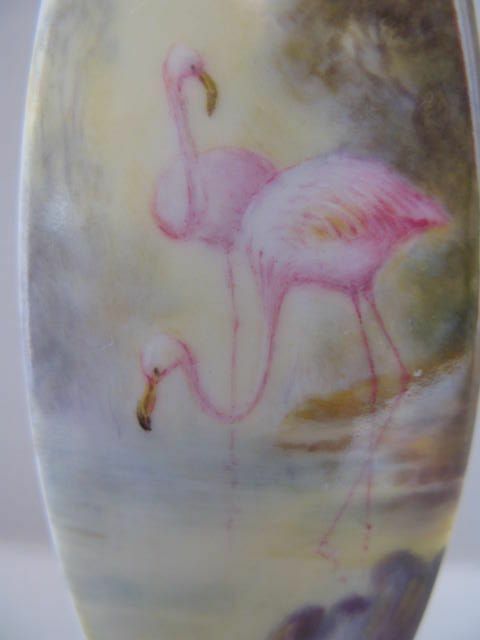 Standing approximately 12.1/4"long x 7.1/2"wide x 3.1/4"high, it has the puce factory stamp for 1930 and is in very good condition with no damage or restoration, virtually no wear to the gilding and only a little fine crazing to the glaze underneath the footrim. 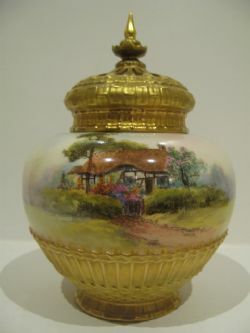 A Royal Worcester Country Cottage Painted Pot Pourri By R. Rushton. 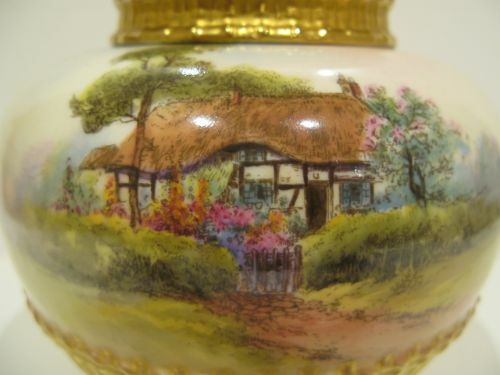 A very attractive, Royal Worcester porcelain pot pourri, shape number 1286, which is complete with its inner and outer lids and has a well painted scene by Raymond Rushton of a thatched country cottage in springtime with flowering shrubs and lilac(?) 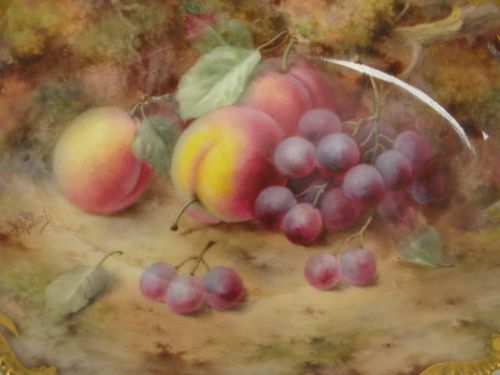 tree titled under the footrim "Elmley, Worcestershire". 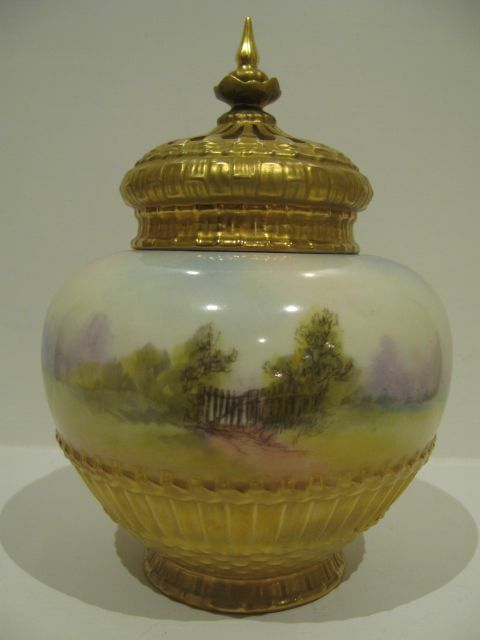 Standing approximately 7.3/4"overall height x 5.1/2" diameter, it has the puce factory stamp for 1929 and is in excellent condition with no damage, crazing or restoration and the gilding is bright and virtually without wear. 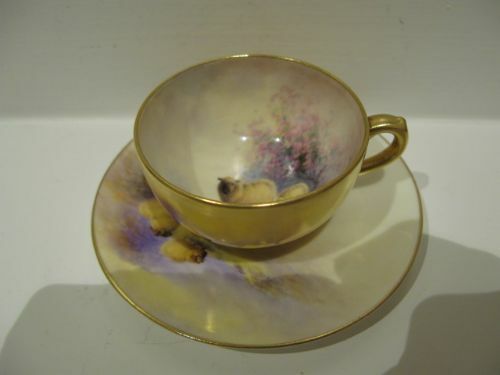 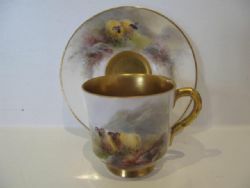 A Royal Worcester Cup And Saucer By H. Ayrton And H Stinton. A generously sized Royal Worcester porcelain cup and saucer, with well painted fruit decoration by Harry Ayrton and Harry Stinton. 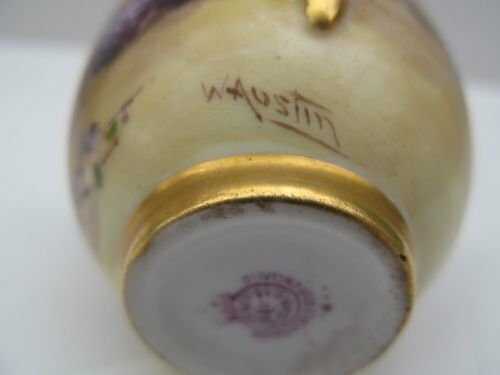 The cup measures approximately 3"tall x 4.7/8"wide over the handle, is signed by Harry Ayrton and has the puce factory stamp for 1933. 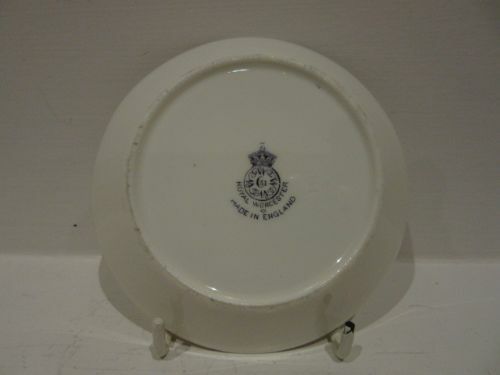 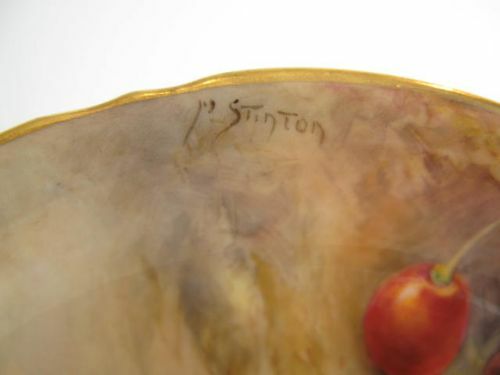 The saucer measures 5.3/4"diameter, is signed by Harry Stinton and has the puce factory stamp for 1926. 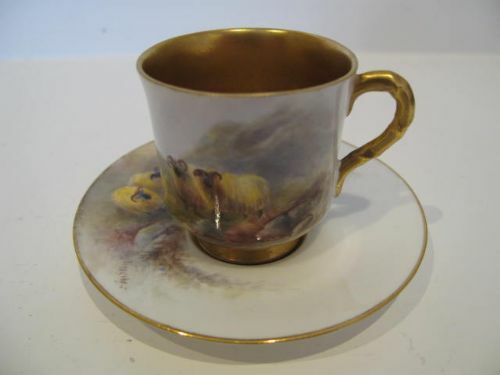 Both pieces are in very good condition with no damage, crazing or restoration, and apart from the usual small scuffs to the gilt well of the saucer, the gilding is fresh and virtually without wear. 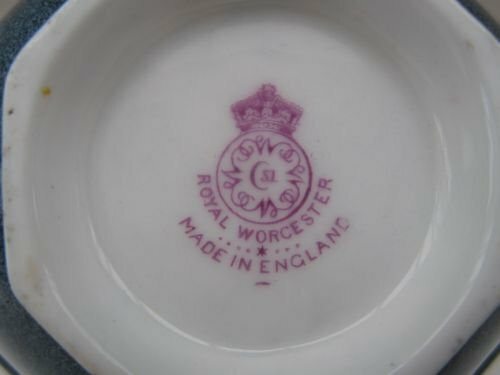 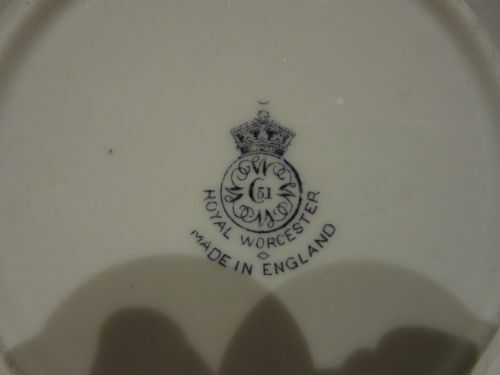 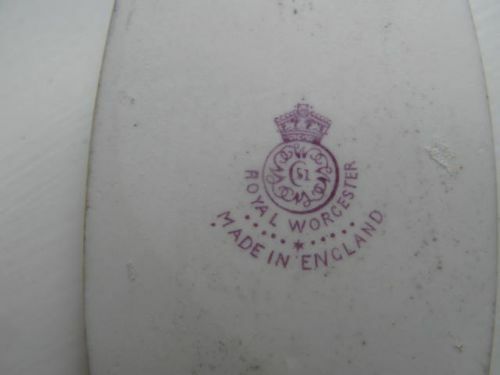 A Royal Worcester Cup and Saucer By J.Stinton, Date Code 1921. 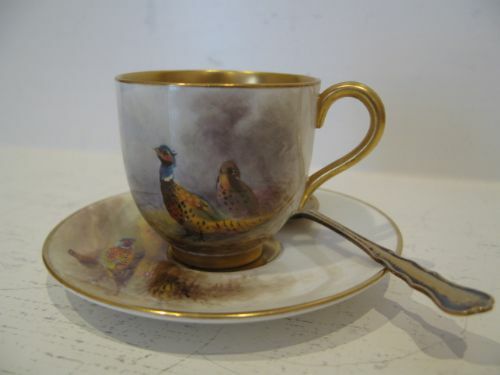 A Royal Worcester pheasant painted cup and saucer by James Stinton complete with silver gilt teaspoon. 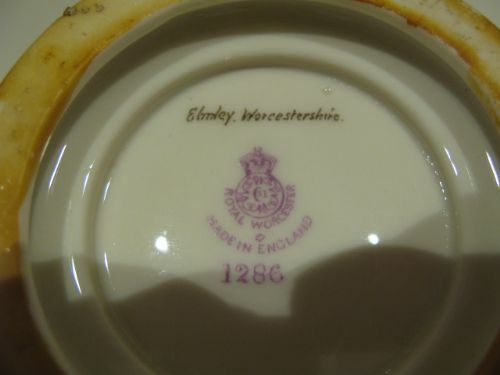 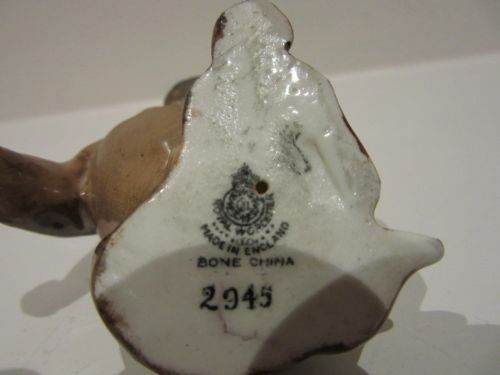 Standing approximately 1.3/4"high x 2"diameter with the puce factory stamp for 1921, in good un-restored and un-damaged condition with very little wear to the gilding but the cup shows a little crazing underneath and the saucer is crazed to the top and the base, but no cracks. 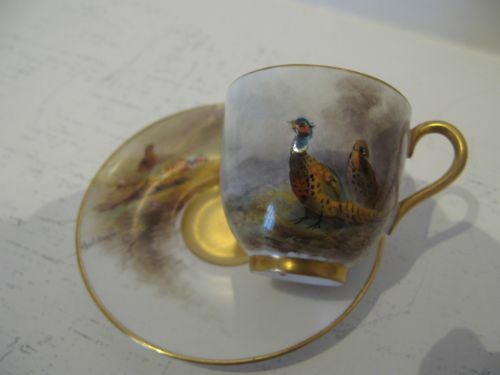 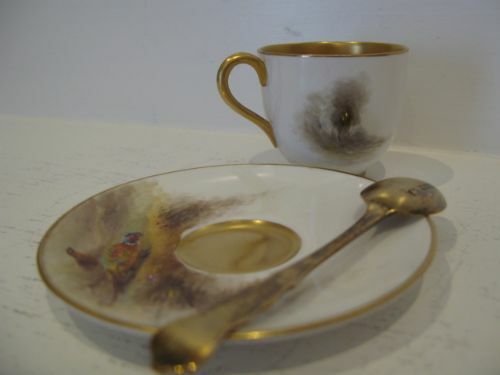 A Royal Worcester Demi-Tasse Cup And Saucer By E. Barker. 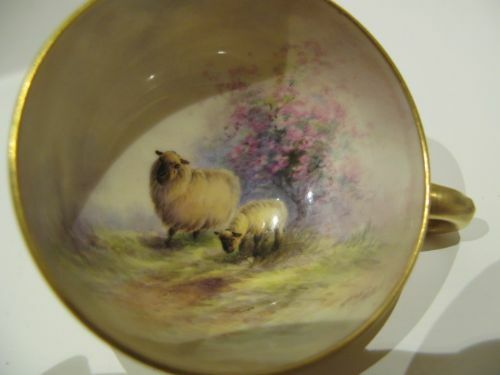 A lovely little Royal Worcester porcelain demi-tasse cup and saucer, with a very well painted springtime scene of black faced sheep and flowering cherry trees in the background by Ernest Barker. 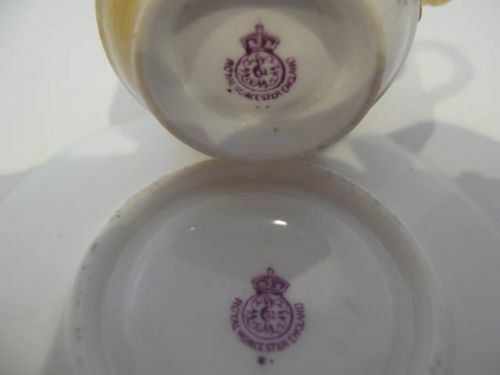 The cup measures 2.1/4"diameter x 1.3/8"tall with the saucer being 3.3/4"diameter, and both have the puce factory stamp for 1922. 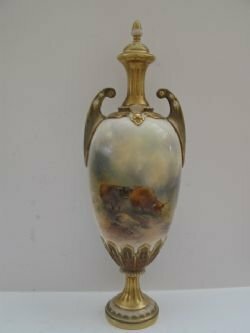 They are in excellent condition with no damage, crazing or restoration and apart from one or two very slight scuffs, the gilding is bright and without wear. A Royal Worcester Demi-Tasse Cup And Saucer With Painted Cattle By H Stinton. 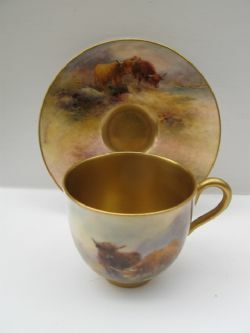 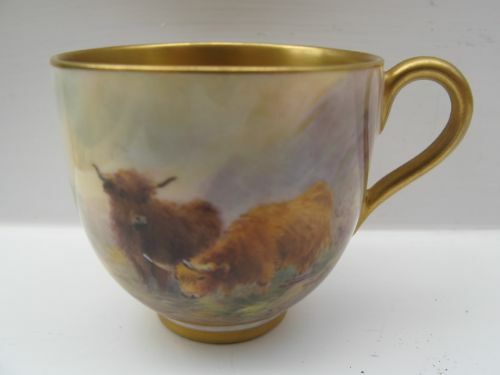 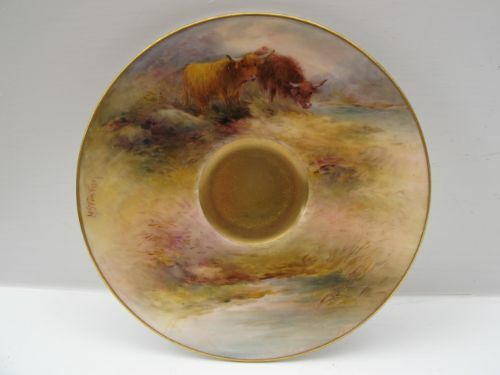 A Royal Worcester porcelain demi-tasse cup and saucer, with well painted scenes of Highland Cattle in a mountainous Scottish setting by Harry Stinton. 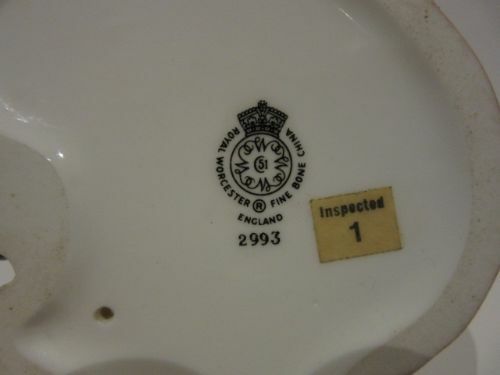 The cup measuring approximately 2.1/16"diameter has the puce factory stamp for 1926, and the saucer at 3.7/8"diameter has the puce stamp for 1925. 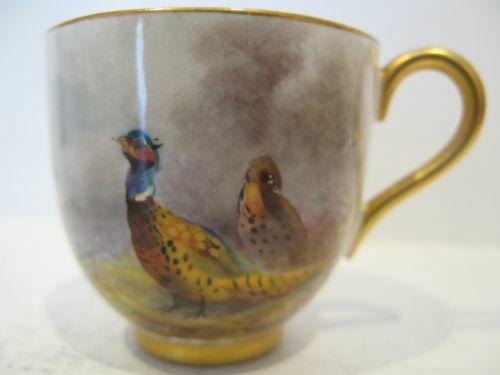 Both are in excellent condition with no damage, crazing or restoration and the gilding, apart from a little scratching in the well of the saucer, is without wear. 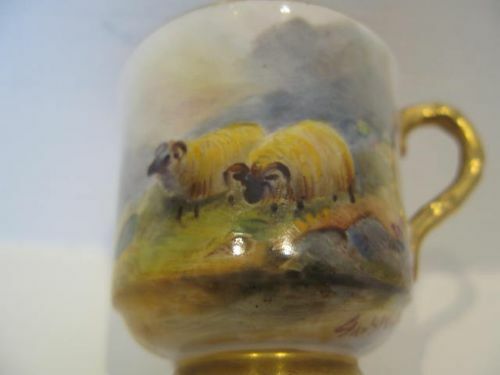 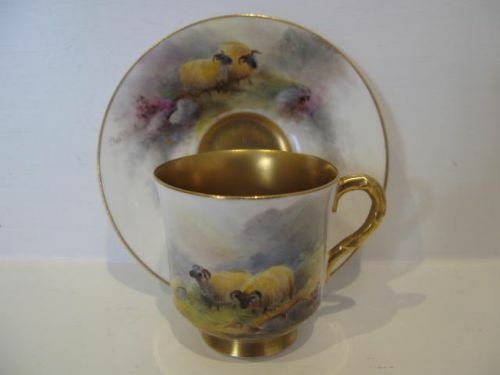 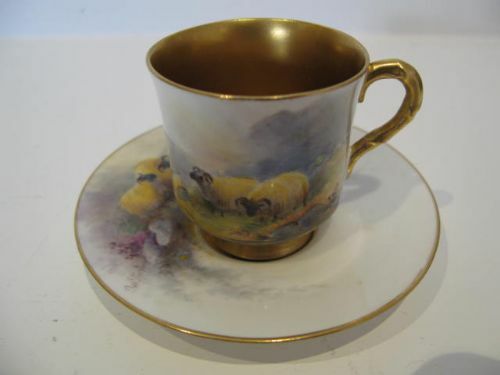 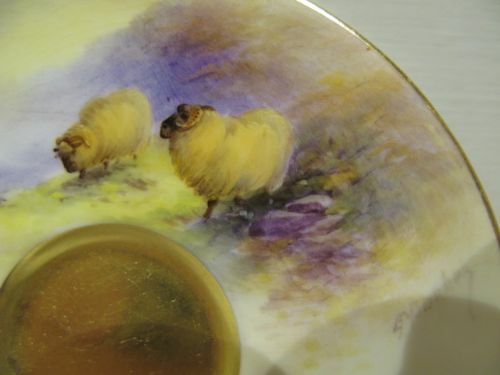 A Royal Worcester Demi-Tasse Cup And Saucer, With Sheep Painted Decoration By J. Stinton. An attractive Royal Worcester porcelain demi-tasse cup and saucer, with well painted sheep in mountainous Scottish scenery by James Stinton. 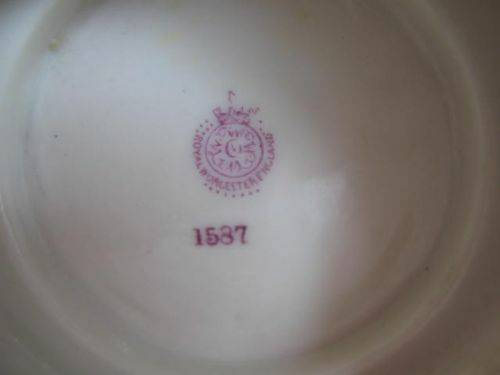 The cup measures approximately 2"diameter x 2"high, the saucer approximately 3.3/4"diameter, and both have the puce factory stamp for 1917. 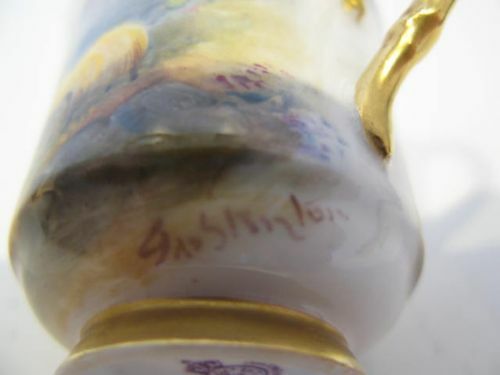 They are in very good condition with no damage, crazing or restoration and the gilding shows very few signs of wear. 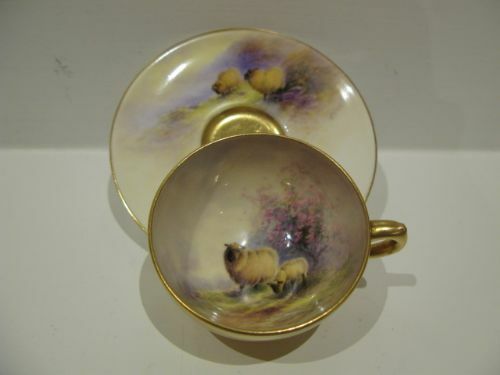 An attractive, Royal Worcester porcelain demi-tasse cup and saucer, with well painted sheep in mountainous Scottish scenery by James Stinton. 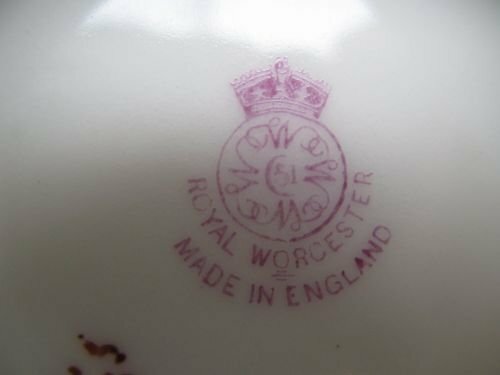 The cup measures approximately 2"diameter x 2"tall, the saucer approximately 3.3/4"diameter and both have the puce factory stamp for 1917. 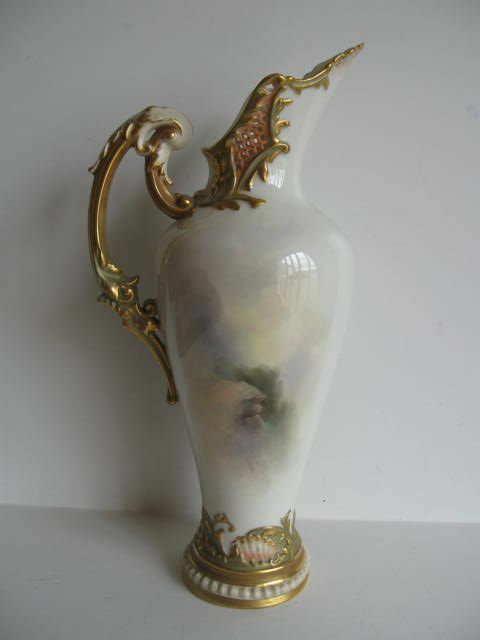 They are in very good condition with no damage, crazing or restoration and the gilding shows virtually no signs of wear. 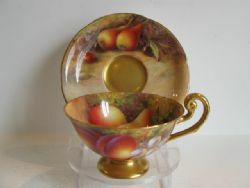 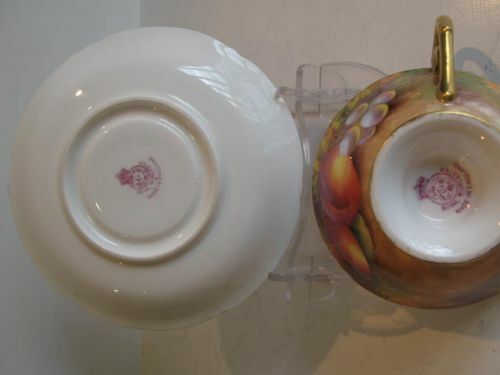 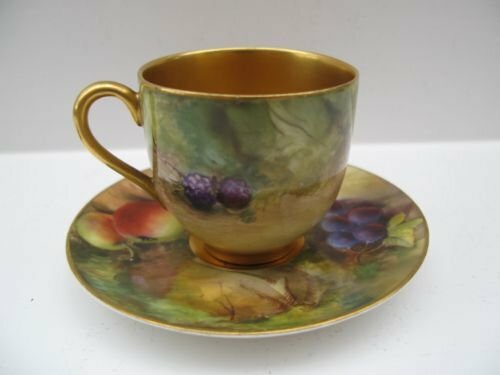 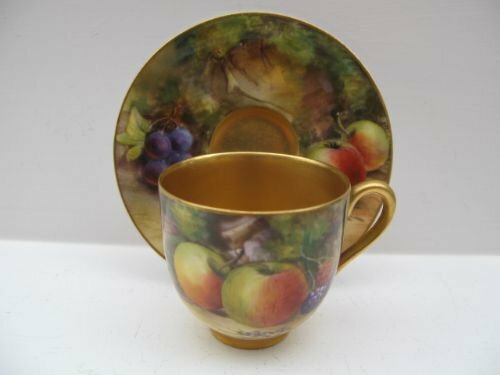 A Royal Worcester Demi-Tasse Fruit Painted Cup And Saucer By W.Austin. 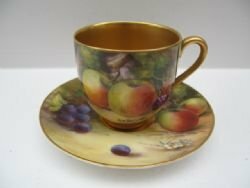 A Royal Worcester porcelain demi-tasse cup and saucer, with well painted fruit decoration by Walter Austin. 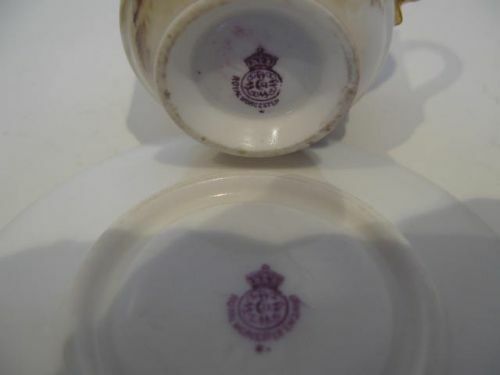 The saucer measures approximately 3.3/4"diameter and the cup stands 2"tall x 2"diameter, and both have the puce factory stamp for 1919 and are in good condition with no damage, crazing or restoration, and the gilding shows only slight signs of wear, mainly to the well of the saucer where the cup sits. 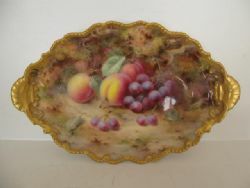 A Royal Worcester Dish With Painted Fruit Decoration By F. Roberts. 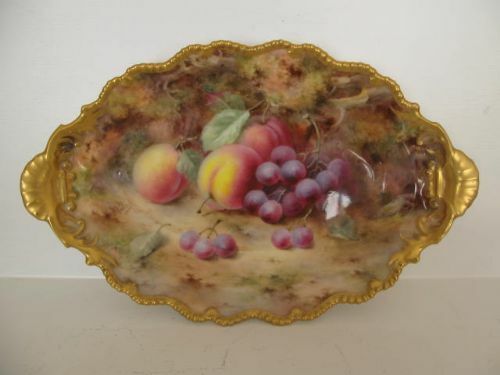 A good Royal Worcester porcelain serving dish with a heavily gilt, shaped and gadrooned border, superbly painted with fruit decoration against a mossy background by Frank Roberts. 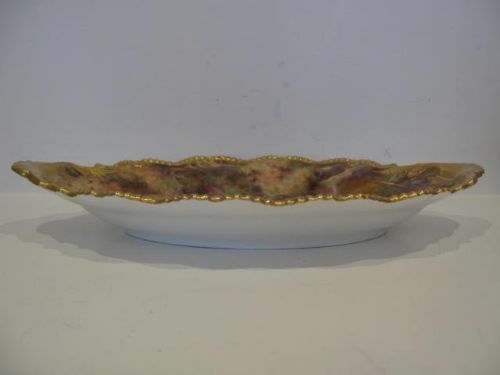 Standing Approximately 12.1/4"long x 7.1/2"wide x 1.3/4"high, it has the puce factory stamp for 1919 and is in excellent condition with no damage, crazing or restoration and the gilding is fresh and without wear. 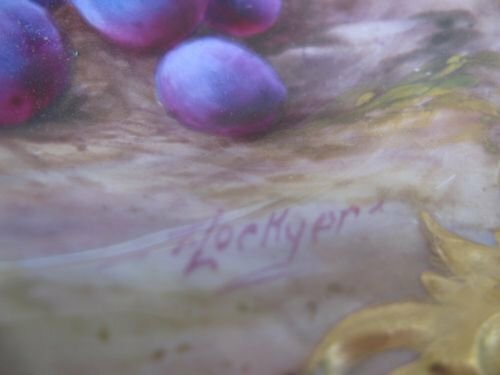 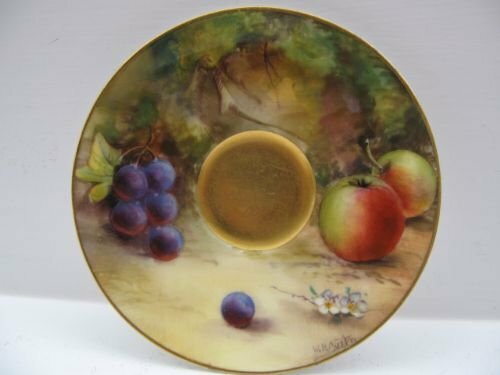 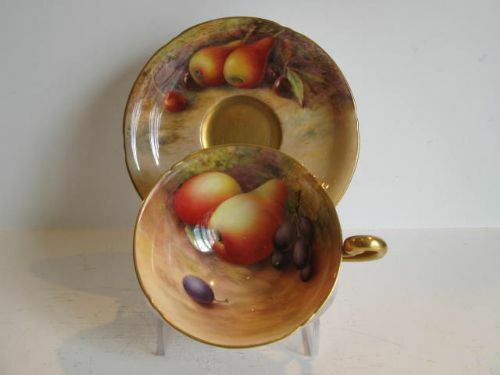 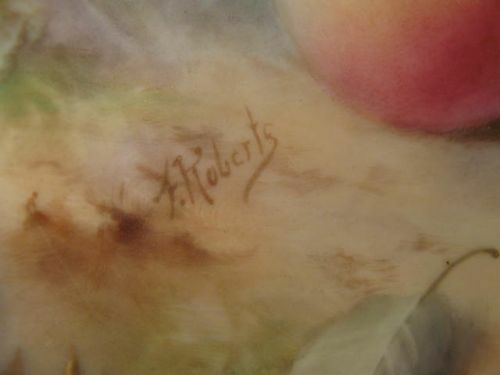 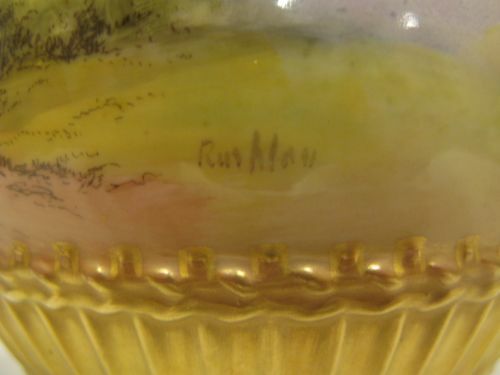 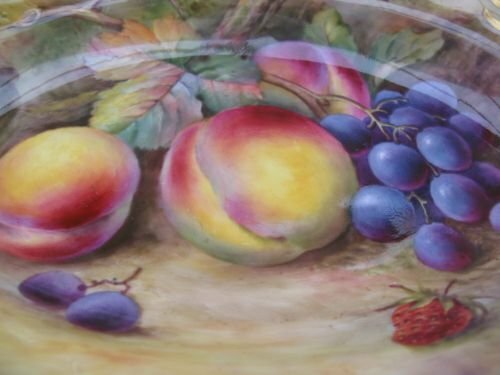 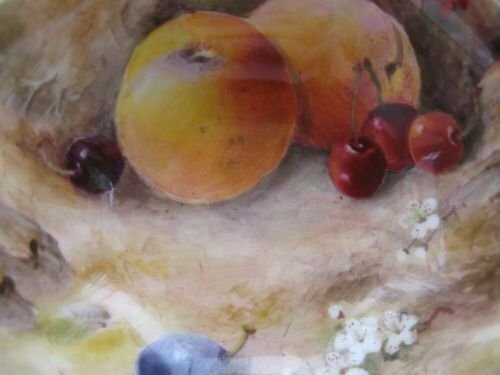 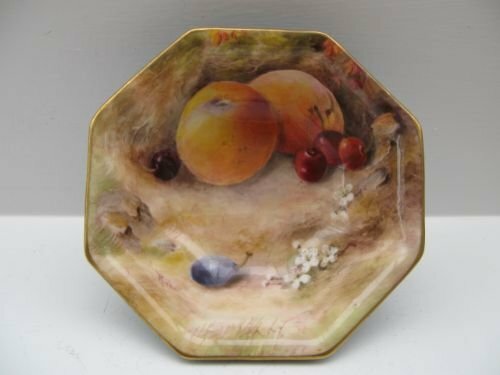 A Royal Worcester Dish, Fruit Painted By Ricketts. 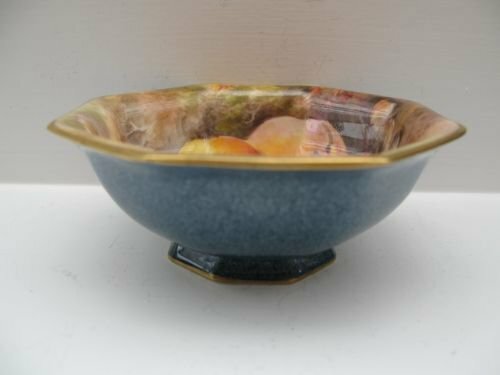 An attractive, Royal Worcester octagonal dish with blue mottled decorated exterior and well painted fruit decoration to the interior by William Ricketts. 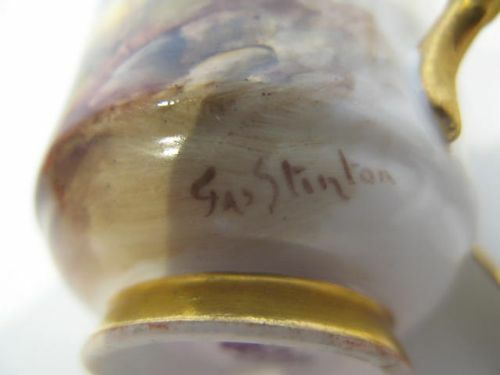 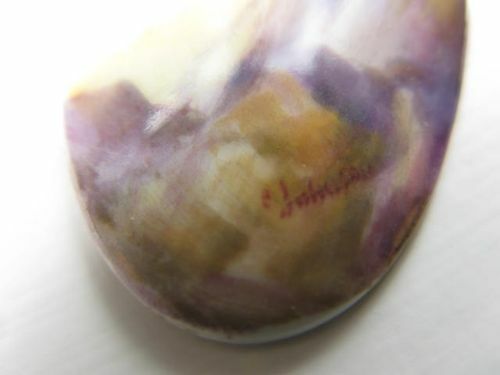 Standing approximately 4.1/4"wide x 1.3/4"deep, it has the puce factory stamp for 1923 and is in excellent condition with no damage, crazing or restoration, and the gilding is fresh and unrubbed. 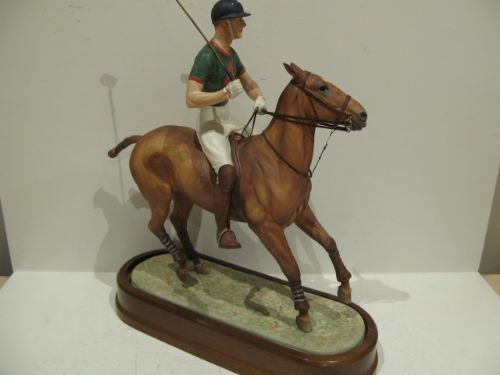 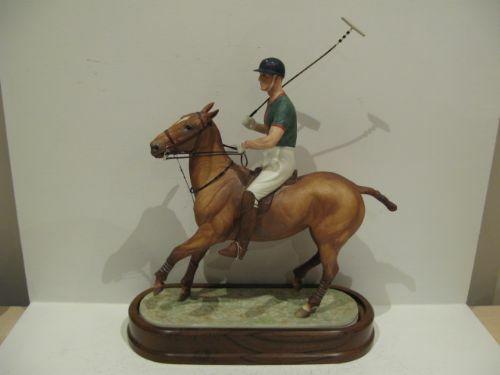 A Royal Worcester Equestrian Statuette Of H.R.H. 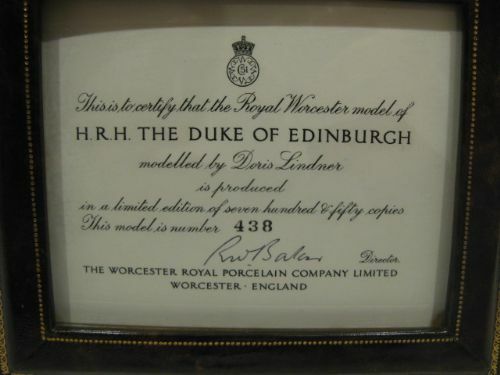 Duke Of Edinburgh. 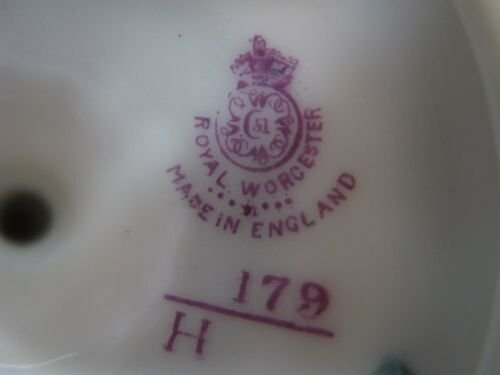 A fine Royal Worcester porcelain study of H.R.H. 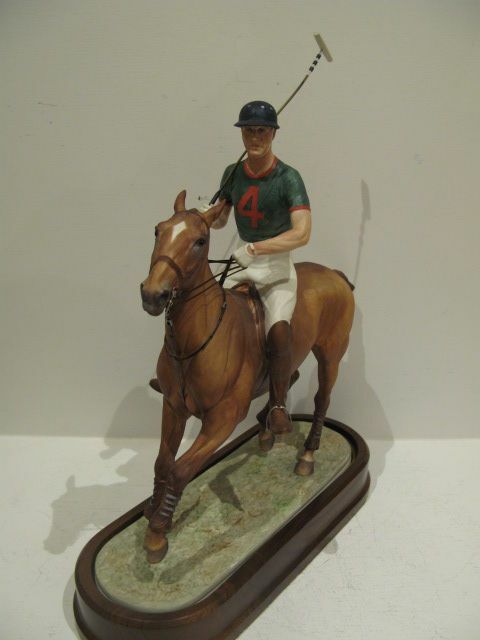 Duke of Edinburgh on his polo pony, modelled by Doris Lindner and issued in 1968 in a limited edition of 750. 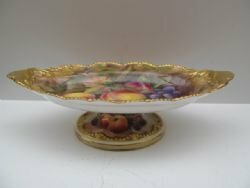 It measures approximately 11"long x 13"high excluding the base, and is complete with its Royal Worcester certificate number 438 of 750. 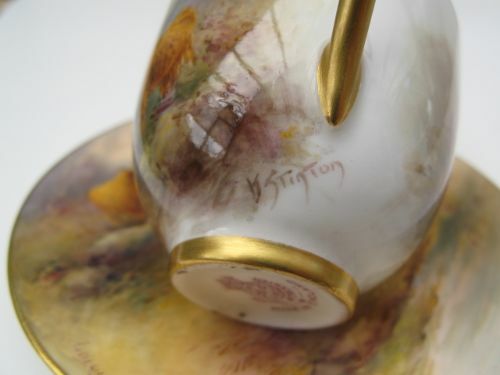 It is in excellent condition with no damage or restoration, and the colours are bright with no fading. 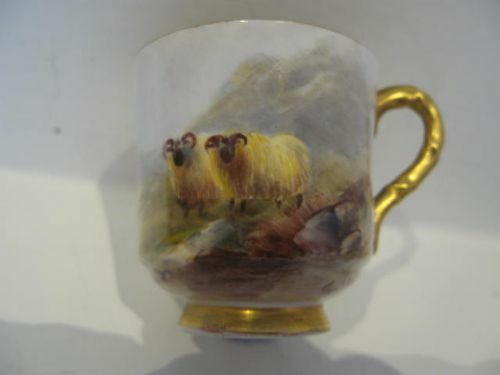 A Royal Worcester Ewer, With Cattle Painted Decoration By H Stinton. 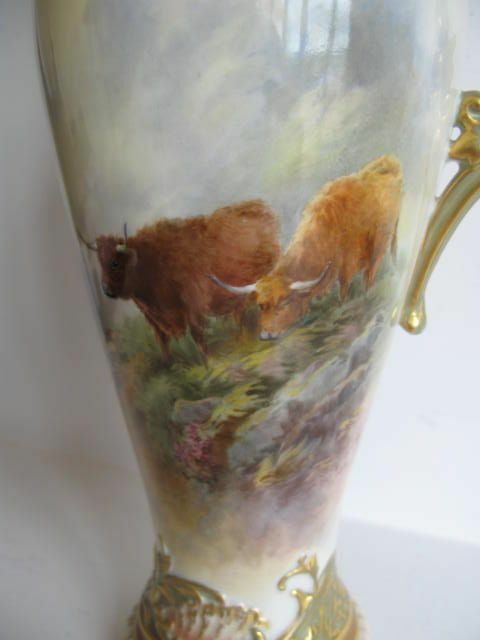 A tall and elegant Royal Worcester reticulated neck porcelain ewer, shape number 1587, with very well painted Highland Cattle in mountainous Scottish scenery by Harry Stinton. 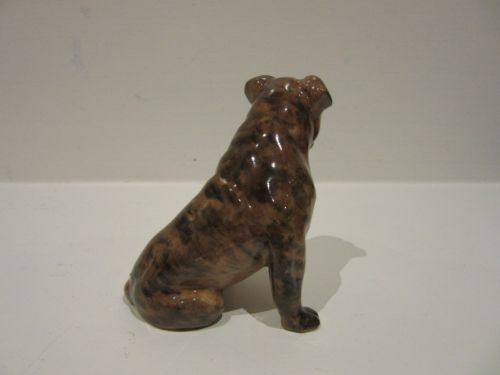 Standing approximately 12.1/4"tall x 5.1/2"wide over the handle, it has the puce factory stamp for circa 1911 and is in excellent condition with no damage, crazing or restoration and the gilding is bright and virtually unworn. 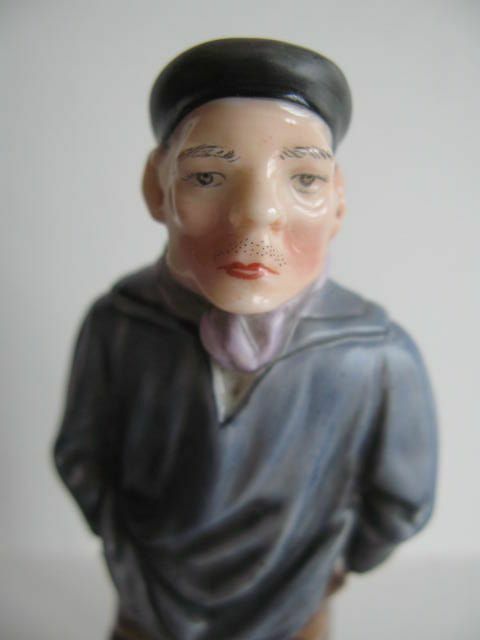 A Royal Worcester Figure "The Frenchman" From the Men Menuholder Series Circa 1874. 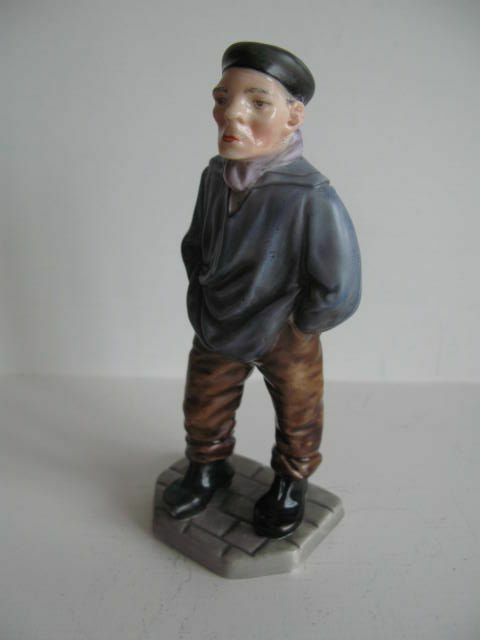 A good early figurine titled "The Frenchman", from the Royal Worcester "Men Menuholder" series introduced in 1874. 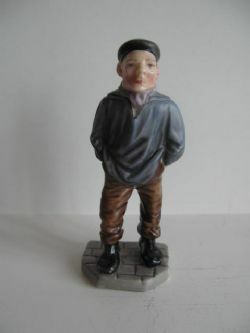 These pieces were based upon down and out characters who could be seen on the streets of London, and were designed to be used at table with a menu card hung over the shoulders of each piece in the manner of a "sandwich board man". Standing approximately 5.1/2"tall x 2.1/4"wide x 1.5/8"deep, it has the factory impressed mark and registration mark and is in excellent condition with no damage or restoration, and the colours are still vivid and without fading. 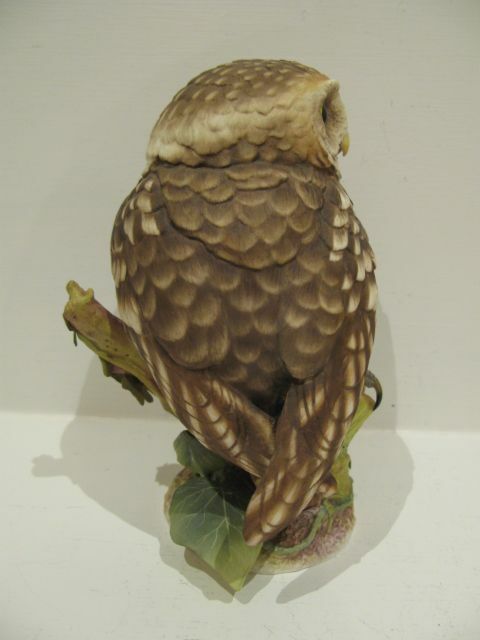 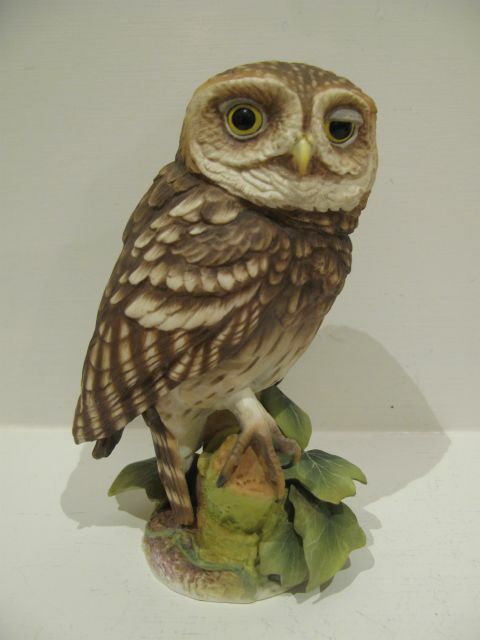 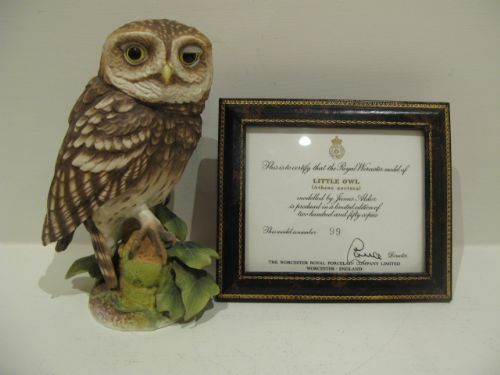 A Royal Worcester Figurine "Little Owl" By J. Alder. A very well detailed Royal Worcester porcelain limited edition figurine titled "Little Owl (Athene Noctura)", modelled by James Alder. 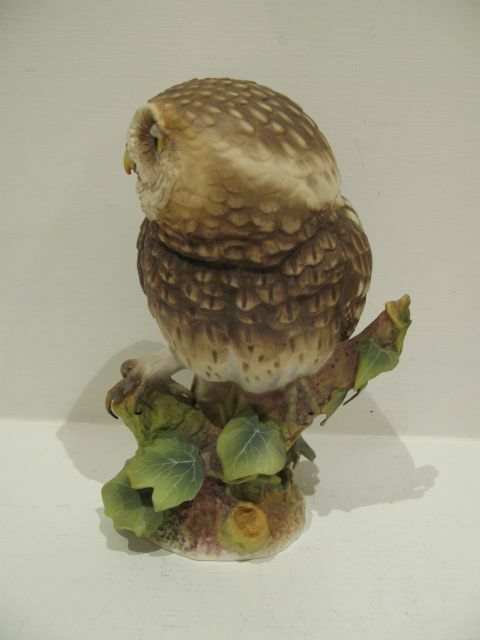 Numbered 99 of 250 and dating to circa 1979, it stands approximately 7"tall x 4"wide and is in excellent condition with no damage, crazing or restoration. 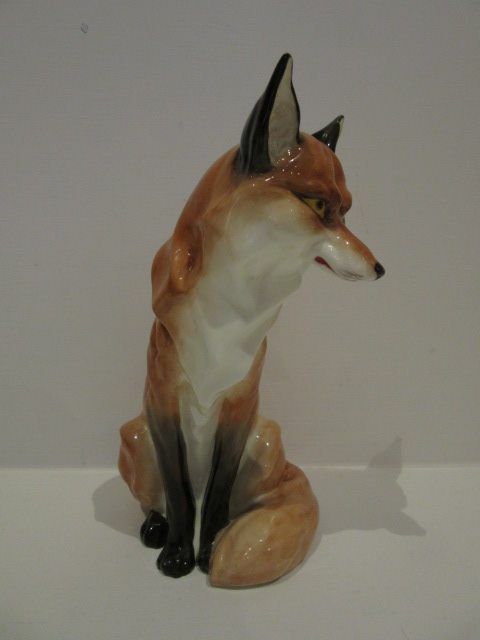 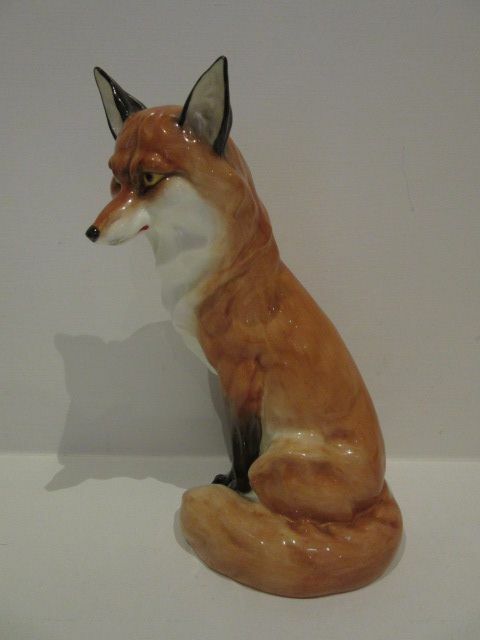 A Royal Worcester Figurine Of A Seated Fox By D. Lindner. 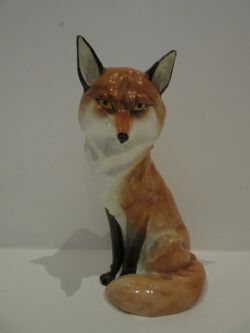 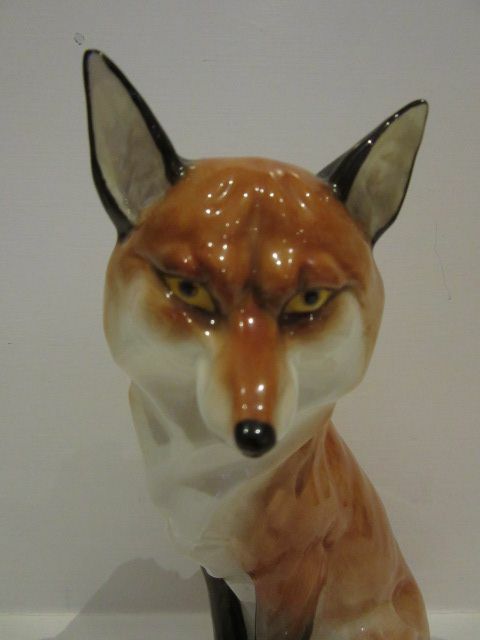 A well detailed Royal Worcester porcelain figurine of a seated fox, modelled by the specialist artist Doris Lindner. 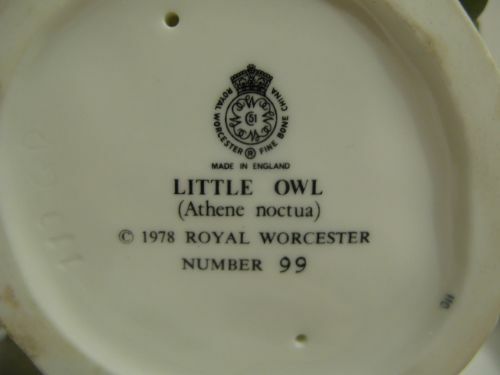 Measuring approximately 7.1/2"tall x 3.1/2"wide x 4.1/4"deep, it has the black factory stamp for circa 1975 and is in excellent condition with no damage, chips, crazing or restoration. 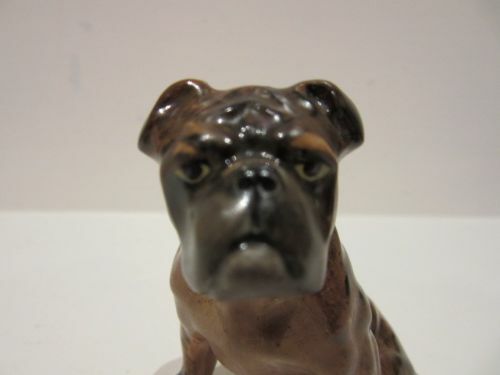 A Royal Worcester Figurine Of Bulldog. 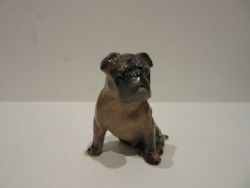 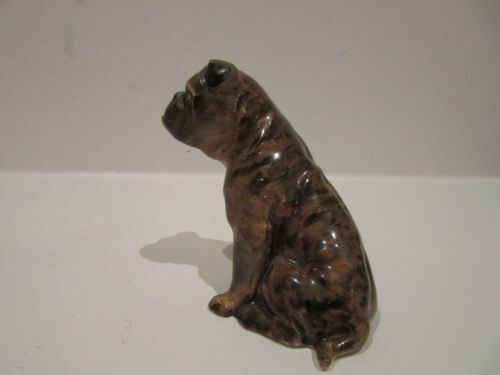 A well modelled Royal Worcester porcelain figurine of an English Bulldog, shape number 2945. 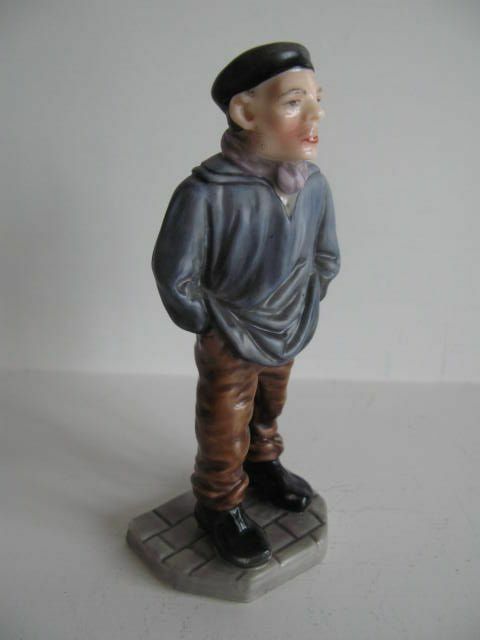 Standing approximately 2.1/2"tall x 2.1/4"wide x 2.1/4"deep, it has the black factory stamp for 1941 and is in excellent condition with no damage, crazing or restoration. 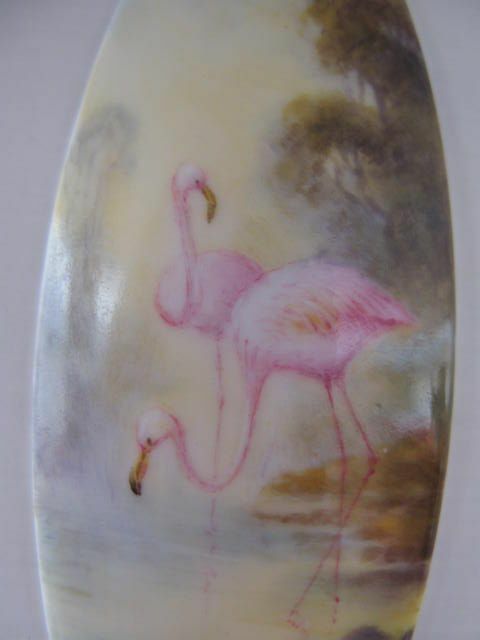 A Royal Worcester Flamingo Painted Oval Plaque By G. Johnson. 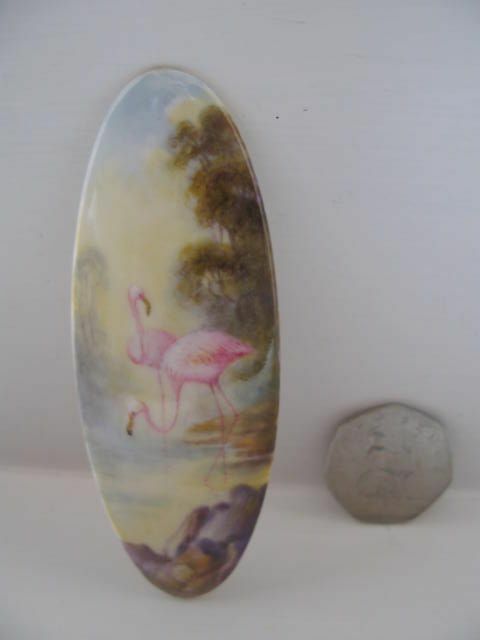 A lovely little Royal Worcester porcelain oval plaque, with a well painted scene of two flamingos wading in a tree lined rocky pool by the specialist artist George Johnson, described by Sandon as a "Master in his own field". 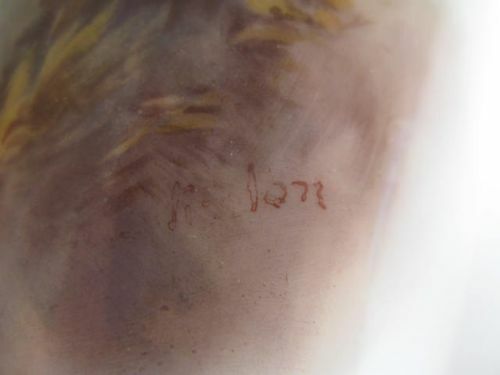 Measuring approximately 3.3/4"tall x 1.3/8"wide, it has the puce factory stamp for 1926 and is in excellent condition with no damage, crazing, scratches or restoration.